Here's a tale of two rooftops. In the outer suburbs lives a 'typical' family: two parents and two kids in a freestanding house with a small backyard. During the summer holidays, as the crickets chirp and magpies warble, the house reverberates with its own seasonal sounds — the sawing, hammering and drilling of home renovations. The family starts by installing energy efficient lights and better insulation, then caps it off with some serious roof bling, a 5kW solar system facing the street. It all costs a lot upfront, but will pay for itself in years to come through much lower energy bills. Meanwhile, in a sweatbox apartment closer to the city, lives a single mum raising a daughter. She's worried about energy prices too, but without access to her own rooftop, she has fewer options to do something about it. As a renter she can't make major improvements to the property without her landlord's permission. Even if she could, why spend thousands of dollars of her own money installing solar panels when, under current tenancy laws, she could be kicked out with just a few months' notice? This is Australia's looming inequality issue — access to clean energy technology. Right now it's about rooftop solar and 'heat pumps' (reverse cycle air con used for efficient heating), but in years to come it will extend to home batteries, smarter appliances and electric vehicles charged at home. Those who can take advantage of the coming energy revolution will have lower bills and more comfortable living conditions during the frequent extreme weather events we'll experience with climate change. Those who can't will be left reliant on a dirty, aging and increasingly expensive electricity grid. This isn't a class divide based on income or education. Ten years ago, the Murdoch tabloids ran stories on inner city greenies installing solar panels with generous feed-in tariffs, subsidised by 'battlers in the 'burbs'. Not anymore. Subsidies are no longer the selling point, and greenies no longer the main buyers. The plunging cost of the panels themselves has made rooftop solar the cheapest form of power available for just about everyone. It's now mainstream, driven by economics, not environmental concerns. In Victoria, for example, the top postcodes for solar installations are suburban growth areas like Cranbourne and Craigieburn, not the hipster enclaves of Brunswick or Fitzroy. "The barriers to going solar are shifting from lack of finance to lack of access to roof space. Echoing an increasingly common theme in Australian society, the divide is between homeowners and renters." It's a similar story in northern states. 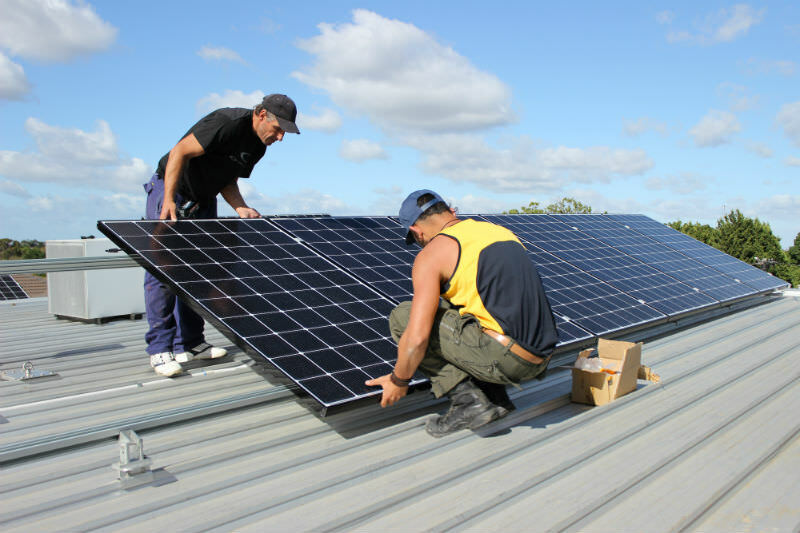 Researchers at Queensland University of Technology analysed the uptake of rooftop solar in south-east Queensland and found that income was not a significant factor — the five lowest socio-economic postcode areas had similar rates to the highest socio-economic areas. And so the barriers to going solar are shifting from lack of finance or knowledge to lack of access to roof space. Echoing an increasingly common theme in Australian society, the looming divide is between homeowners and renters. An April 2018 report from EnergyLab found owner-occupiers are seven times more likely to have solar on their roof than renters. The reason is the so-called 'split incentive' problem. The landlord pays the upfront costs to install the panels, but doesn't get the financial return of lower electricity bills, which go to the tenant. But the tenant is unlikely to invest in rooftop solar because the average payback period is four years, longer than the typical lease. There are a few clever startups addressing this problem. The company Matter brokers a deal between landlord and tenant — the landlord installs solar panels, and then sells the electricity generated to the tenant at a rate lower than they would get from the grid. Tenants save on their power bills, and the landlord makes a profit too. Another company, SunTenants, solves the problem an entirely different way. The landlord pays to install the panels, then recoups the costs by raising the rent a fair amount (less than the electricity savings that will accrue to tenants). SunTenants then monitors the actual solar output and savings to make sure both parties are benefiting. For apartment blocks, the tricky part has been how to distribute the solar power to individual units and then bill them accurately. A Melbourne startup, Allume Energy, is now offering a behind-the-meter solution, with technology that monitors how much solar power each apartment is using. But while startups are finding innovation solutions, governments still need to update rules and regulations to support their efforts. Dr Bjorn Sturmberg, the founder of SunTenants, was involved in one of the first projects in Australia to install solar and batteries on an apartment block. He told an energy conference last year that 'bureaucratic paper wars' hampered the project for 18 months. This echoes my own experience with installing a shared 17kW solar system on the roof of a cohousing community in Heidelberg Heights — without a clear model to follow, we had to improvise our own solution, including doing all our own data collection and project management, then negotiating with an electricity distributor and retailer. For this solution to go mainstream, the process needs to be streamlined. It's not just the energy market the needs to be updated, either; we also need to reform tenancy laws. If renters have longer and more secure leases, they'll be more likely to invest considerable time and energy into coming to an agreement with their landlord to install solar. The disparity between homeowners and renters when it comes to energy costs might seem small now, but it will increase if we enter the electricity grid 'death spiral'. The death spiral theory goes like this. As more households embrace energy efficiency, solar and batteries, demand for electricity from the grid drops. Some homes go off-grid completely and the customer base shrinks. But energy networks still need to recoup costs, so they increase charges to the homes that remain connected. That creates a further incentive quit the grid, and the cycle escalates. Last month Audrey Zibelman, CEO of the Australian Energy Market Operator, told a forum that booming rooftop solar installations could 'invite an economic bypass' of the grid, creating exactly this situation of 'the haves and the have-nots'. Equality isn't a concept always associated with new energy technology, but it's fundamental to long-term success. Ultimately, the transition to sustainability has to be sustainable itself. If too many people are left behind they'll actively resist the change, and the backlash could unravel any progress made. The last thing we want is a country divided into who has access to clean energy and who does not. But unless we can help renters get solar and energy efficiency upgrades, we're heading towards this future of rooftop inequality. Greg Foyster is a Melbourne writer and the author of the book Changing Gears. He'll be taking a break from this environment column, returning December 2018. Main image: Shared solar system being installed on an apartment block at Murundaka Cohousing Community, Heidelberg Heights. I suppose if all the "haves" install clean energy solutions which donate surplus to the power grid and also place less demand on the grid, the number of coal burning power sources will correspondingly be reduced. Those who rely on the grid will also find their costs substantially reduced. It seems the "have nots" will also benefit enormously. Maybe this an example of the trickle down effect of progress to society as a whole. It will remain a class division. No matter what is done, poor renters, like single mums, no matter what their roof access, will be left in uninsulated accommodation and no solar panels. The direct fuel cell invented by Ahmed El Safty and developed at Qld university converts coal to gas with no combustion and saves 98% 9f the CO2 emissions. Why do we attack the coal industry so vehemently? Thanks Greg for a highly insightful article. One of the brilliances of capitalism is the constant development of new technology, and occasional, though now more frequent, radical "tech disruptions". These should be welcomed but also lead to aggregation of great wealth by a small controlling minority and the likelihood of economic distress for the many. Society needs to rapidly respond with equally radical national and international policies to sustain the common good, but also needs to throw up the leadership to do so. For example, John Monash insisted that Victoria`. It really should not be difficult to ensure that we can have both entrepreneurship with substantial reward for the innovators and yet a civilised degree of equity and benefit for all. There has to be a reasonable common share in such development or there will be inevitable political disruption and pain. Come on Malcolm/Bill...surly you get it?! I'm not quite convinced by the argument - having rented an apartment and now owning an apartment (ie mortgage) - clean energy through solar is something body corporate need to deal with, and as a propert owner and member of a body corporate I know that I'm merely one voice in 100 or more in my building. I don't feel much more powerful as a "landlord" now in having the power to reverse global warming than I did as a footloose and fancy-free renter! I`m sorry but I managed to garble my comment on John Monash. I meant to say that he insisted that Victoria`s new electricity system in the 1920`s had to go everywhere in the state and had to be of the same price for everyone, wherever they lived. There was a big element of central control in this and it is possible that we are moving too far away from state management of literally vital services for the common good. Lots of good things in this article. The market is always coming up with ingenious solutions, not because entrepreneurs are as such charitable, but because they want to address the needs of the consumer in order to make a profit. As Adam Smith said, it's not from the benevolence of the butcher, brewer and baker that we have our meal, but from their own self-interest. One error is the crazy "death spiral" theory mentioned, which violates a fundamental law of economics, and common sense: to maximise revenue, you should set your price that point on the demand curve that you face here and now - REGARDLESS of past or future curves - where price times quantity sold is at a maximum. To raise prices per client just because the number of buyers is historically shrinking is, well, suicide for your business. Did Cobb & Co charge thousands per journey for its tiny customer base in the 1920s? Don't think so. Consumers just don't reflexively pay more for a good because there are less of them (consumers) around! They go for substitutes! "Passing on costs" is a myth that companies often mouth and cognitively dissonant professors write into textbooks, ignoring basic principles they laid down way back on page 5. Consumers make their own decisions as to whether they will deign to have the costs "passed on" to them, thank you very much ! I'm a childless woman, living in a rented unit, completely dependent on the age pension. Technically, I belong to the most financially vulnerable sectors of Australian society. (In fact, I don't, because I have a high degree of housing security and I pay a very low rent). A few years ago, a small financial windfall enabled me to begin negotiations for a solar panel - I do have enough roof space. But I'm not eligible for the rebate because I rent. The owners offered to pay for the panel themselves - but they weren't eligible because they weren't the occupiers. My windfall is gone now (consumed by energy costs and high living?) so my chance is gone. I strongly affirm this article - I'm not poor and needy but I can easily see how current policy is deepening the divide between rich and poor, and making the way out even more difficult for those children in the rented flat. Is this really what we want? But someone wants it, or the system would be changed.